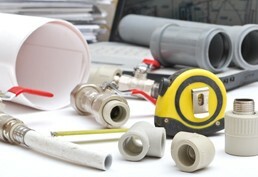 We're plumbers covering Stretton and Stockton Heath with a fully comprehensive plumbing service. We can attend to any task from fitting a new tap washer to installing a new central heating system or that new bathroom you've been considering. We've gained an excellent reputation throughout Stockton Heath and Stretton for providing a versatile, full plumbing service to a high standard. This should reassure you you're not only dealing with a full-service plumber, but one who can undertake all tasks professionally and efficiently. Of course, the only way is to see for yourself so please do get in touch to discuss your needs. Concerned such a comprehensive service will prove expensive? Ask for a free estimate - you'll be able to see for yourself how affordable we really are. How convenient is it to know that one plumber's phone number covers all your likely requirements now and in the future? We're keen to build a relationship with you and number you among the many satisfied customers we serve in the Stretton and Stockton Heath areas. We'd like you to feel reassured that your plumbing needs are catered for with one simple phone call to one number, and look forward to helping you soon. Call now on 01925 204955.